Never miss a post, sign up to be emailed! 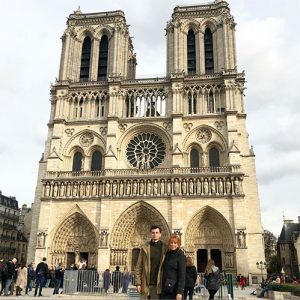 Just a couple of weeks ago, I received a delightful picture of my daughter, Julia and my grandson Ethan in front of the Notre Dame Cathedral. They were in Paris for a week and that's where they chose to take the picture. 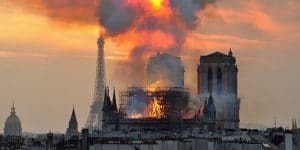 I smiled at the picture with my own memories of being in that great Cathedral twice. First, I went at the invitation of a lovely French woman. And then several years later, I was there in 2008 with John. So when I saw the news and the raging fire, I had tears like Julia. Julia's thoughts were poignant and inspiring, having been so recently there. After sharing her Paris journey, l asked Julia to pen her thoughts, obviously given from above. John asked her to share her response with us and we are grateful she was willing. To see this grand majestic cathedral. To tread those ancient, historical steps. To hear arias sung by Catholic nuns in French, to view the "priceless" objects. To look and look for His presence there. To know that He longs to be to be part of it. I asked Him to be there and He was. And we were. So when the blaze broke out, I knew He had a story to tell and it was His story. And oh, how He had the final word though He uttered not a word. 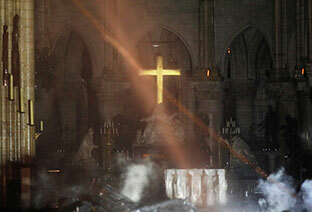 The glowing golden cross? It stood among the torched artifacts as THE Fact. The One and The Only. And I knew that a miracle gift was sent from heaven to all of us earthlings. 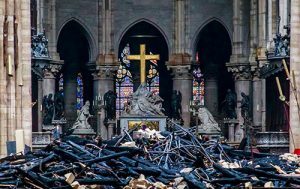 His majestic reign among the burnt, among the scorched, among the ruined, us. It spoke of a God who so longs to be seen and wanted and heard and loved. A God who is our only worthwhile history. History: His story. So with misty teary eyes and a hurting heart, I am once again reminded that only that which He builds, that will stand. That will last. That is unshakable. That will be eternal. And what truly is the "that"? It is inside you and me. And they. And us. Christ's Love: a rock solid building structure inside the heart that adamantly refuses to let go or give up. Impenetrable, it never ever fails or collapses. Eternally constructed, it forever believes in hopes. Matthew 7:24 & 25 anyone who hears these words of Mine and obeys them is like a wise man who built his house on an unshakable foundation. The rain poured down. The river flooded over. The wind blew hard against that house. But it did not fall because it was built on Rock.